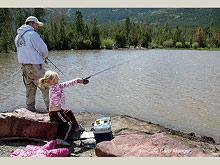 Easily accessible off the Flaming Gorge-Uintas National Scenic Byway, the Moose Ponds are a local favorite! This well stocked pond is right off the highway, offering a surrounding interpretive trail, restrooms, ample parking and fully accessible recreation. As the name suggest, one may have to share the ponds with another local - the moose that inhabit the surrounding forest! Thank you for visiting http://www.flaminggorgecountry.com/Moose-Ponds! Be sure and revisit flaminggorgecountry.com frequently for content updates and more.